Also see biographical sketch of Andrew Flanagan, Sr.
Family lore has it that Sarah Matthews was born in Birmingham, Warwickshire, England to John and Mary Matthews. My best guess as to date of birth is Mar 23, 1805, a date written in the bible of her first child, Mary (Waldron) Shuker. While the Long Island City death register gives her age as 73 (c.1804), the transcription of her gravestone gives it as 78 (c.1799). I think it likely that the number 3 in 73 was read at some point as an 8. Sarah's first child was born in 1827; her last (my ggf Charles) in 1851. My reading of her age would place her childbearing span between the ages of 22 and 46. The gravestone's would put place the span between the ages of 28 and 52, which was as unlikely then as it is today. The Shuker bible also names three other Matthews sisters: Emma born August 1, 1803, Mary Ann born January 12, 1806 and Elizabeth born September 18, 1808. All we know of her family are these names and dates from the Shuker bible. Again, we have a suspicious span of dates. Sarah's Mar. 23, 1805 is slightly less than 9 months before Mary Ann's Jan. 12, 1806. We have not seen a photocopy of the inscription from the Shuker bible. The above dates are as transcribed in a letter from a descendant of (we believe) Joseph Shuker to a descendant of Peter Flanagan. Because compulsory civil registration began a few years after Andrew and Sarah left England, we have found no certain records for family members until 1832 in West Bromwich. We have no confirmed knowledge of Sarah's early years. How long did the family live in Birmingham? When did they move to Wednesbury or West Bromwich? Did they ever really live in Birmingham, or did they simply live "near Birmingham" in a neighboring suburb? If these questions are ever answered, resolution will await research in the records of Warwickshire and Staffordshire. We know only that Sarah's first marriage, to shoemaker James Waldron, took place about 1826, and probably in the Church of England in Wednesbury, Staffordshire, a town across a county line from Birmingham. The Shuker bible gives the date of their daughter Mary Waldron's birth as October 26, 1827, but the register of the parish of Wednesbury shows a baptismal entry for a Mary Waldron, daughter of James and Sarah, recorded September 16, 1827 (FHC film 497344 - Bishop's transcripts, 1673-1850 Church of England. Parish Church of Wednesbury) The clergyman was a G. Clarkson. Mary's birth was followed by another unrecorded period, during which time James Waldron presumably died, freeing Sarah to marry Andrew Flanagan. A possible record of James' death can be found on FHC film 497344, "Burials in the Parish of Wednesbury County of Stafford 1830." Number 953 shows a James Waldron buried August 2, age 36 (? ); burial by G.W. White. 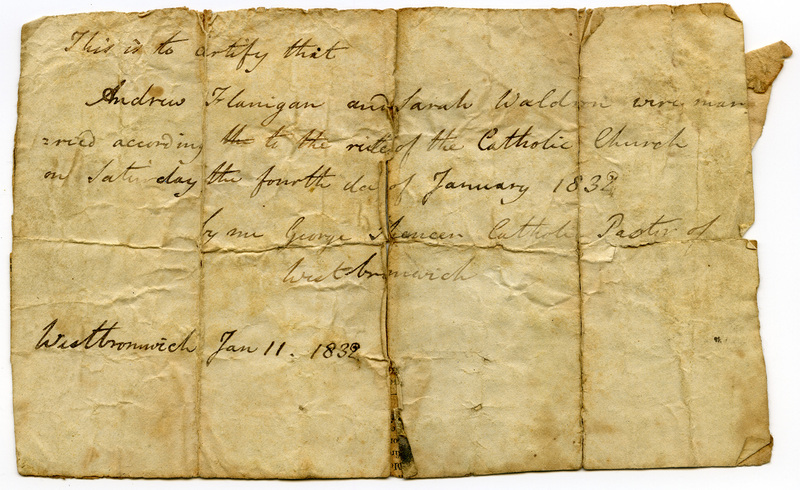 By January 4, 1832 Sarah Waldron was in West Bromwich, marrying Irish immigrant Andrew Flanagan in the newly established and as-yet-unnamed Catholic church in West Bromwich. Because the surviving registers of this church begin somewhat after this date Andrew and Sarah's marriage certificate is all we have to mark this occasion. 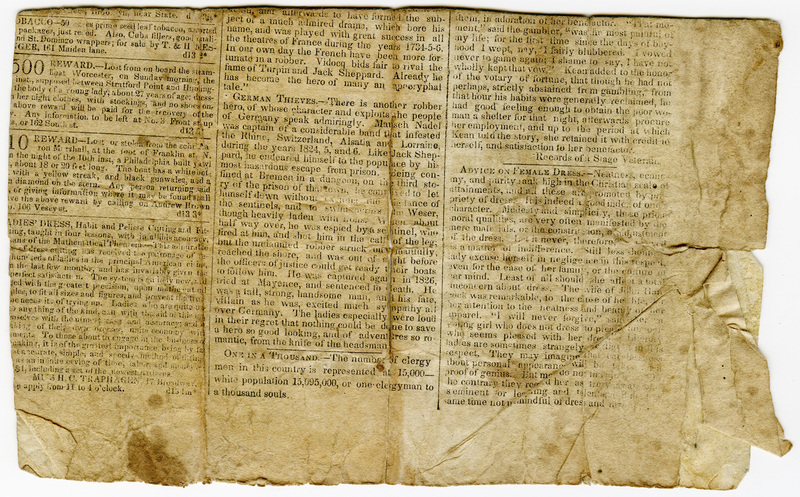 The reverse side has been reinforced by newspaper. The original was found among the papers passed along from Andrew and Sarah's youngest child, Charles, to his daughters Emily and Agnes. Then found among the papers of Anges' oldest son Thomas, who cleared his mother's and aunt's house in 1962. Though family stories recorded by Leonard Fliedner say Sarah remained Protestant Episcopal (and went to whatever church had the best singing), her name appears on a December 22, 1833 list of newly confirmed Catholics in West Bromwich. Her confirmation name was Ann. While all her children by Andrew were raised Catholic, it seems likely that Mary (Waldron) Shuker, raised in England and buried at St. Michael's (a non-denominational cemetery in Elmhurst, Queens), belonged to Church of England. Some of Mary Shuker's children married in Catholic churches, but I don't know the significance of this. 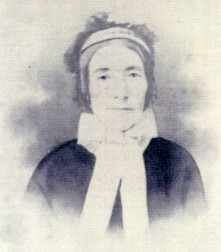 Sarah's second daughter and Andrew's first, Ann Nora (aka Hannah) Flanagan was born on April 11, 1833, and baptized May 19 of the same year, again in the same West Bromwich RC Church in which they were married. Her sponsors were Patrick and Judith Conolly, both unknown to us. The infant died in April 1834 and was buried 25 Apr 1834 in the churchyard of St Martin, Birmingham. Hannah Flannigan burial; Parents: Andrew and Sarah Flannigan; Abode: Park Street; Age: 10 monhts; Ceremony performed by Father Nunns. Andrew and Sarah left England in June 1834, two months after the infant's death, sailing from Liverpool to New York City on the Ship Alfred. We know that Andrew's step-daughter Mary Waldron (age 7 as they departed) was left behind, presumably to be raised by the Matthews (or Waldron?) family in West Bromwich. Mary would not immigrate to Astoria or, we presume, see her mother for at least 20 years -- after she was married to James Shuker and the mother of two sons. While it was not an uncommon practice for parents to emigrate without children, it is impossible not to wonder how Mary felt about being left behind by her mother and step-father in England. I note that Mary Waldron named her female children Sarah, Mary Alice, Ella and Emma, three of these being Matthews names (Elizabeth and Emma Matthews her aunts and Sarah after her mother). This could indicate that she was at least reconciled with Sarah and strongly suggests that she was raised by Sarah's sisters. I also note that her third son -- and the first born in the US -- was named Andrew, possibly in tribute to her stepfather. Mary Waldron Shuker was to become the matriarch of a line of her own. When Sarah sailed into New York Harbor on July 12, 1834, she was unaccompanied by children. However she was pregnant with her third child, James Flanagan, born six months later on Jan 19, 1835 in Brooklyn, New York. Upon finalization of their first Astoria land purchase on May 30, 1836, we assume Andrew, Sarah and James moved from Brooklyn to Hallets Cove. And we assume their second son, John, born Dec 23, 1837, was the first to be born in the Flanagan's own house on Woolsey Street. We've found no official record of Sarah's births in the U.S., but we have two independently compliled lists passed on through the Shuker family and the family of Charles A. Flanagan (youngest son of Andrew and Sarah.) I don't know if any family member has seen Mt. Carmel baptismal records. My family has a handwritten list of birthdates of Andrew and Sarah's ten children born in the U.S., that could have been transcribed from a Flanagan bible. Omitted are the children born in England: Mary Waldron and Ann Nora Flanagan. Most of Sarah and Andrew's children would have been born in the Woolsey Street house, with only the youngest child (Charles) born after the 1850 purchase of the land on 2nd Ave. Most of their children lived to adulthood, with only Ann Nora dying as an infant and William dying in an accident at the age of eight. John died unmarried at the age of 33. All others married, and all but James had children: many children. In a curious pattern, all the other boys: James, Andrew, Peter, Henry, Edward and Charles married girls from the neighborhood and lived their lives in Astoria, within a few blocks of each other. Aside from Edward, who died in a Manhattan hospital, they died within blocks of their places of birth. Their brides -- Bridget Delahanty, Adelaide Exertier, Elizabeth Egan, Mary Casey, Kate Kelly and Anna Loretto Evans -- all grew up within a block or two of the Flanagan homesteads and all were immigrants or daughters of immigrants. In contrast, both daughters of Andrew and Sarah married men from "outside the neighborhood" and left Astoria. Catherine Flanagan married Tipperary immigrant Edmund Butler, a career army officer, had children in four (possibly five) different states and died in 1888 in Omaha, Nebraska. Bridget Amelia Flanagan married Welsh immigrant George Morgan Jones, lived in Manhattan until after her husband's 1908 death, and died in Freeport, Long Island in 1915. Sarah's daughter Mary Waldron married James Shuker in West Bromwich in 1853 and they immigrated to Astoria a few years after marriage, with two children in tow. Mary then lived, gave birth to most of her children, and died in Astoria in 1905. The daughter left behind was the only daughter to reside near Sarah at the time of her death. There has been speculation that Sarah's family was comfortably off. We have found no confirmation of this, but the fact that they were able to purchase land so soon after their arrival supports the contention. We know too little about Andrew's background to know who was the source of the family's money and business acumen. I offer as evidence that they were, at least, thrifty, the fact that Andrew and Sarah traveled in the steerage section of the ship Alfred. Sarah survived Andrew by seven years, and in those years she arranged the family's real estate holdings so that each of her children (Mary Waldron Shuker included) had a share in the various properties on First and Second Avenues and on Main Street. For all we know, Andrew might have begun this practice, but all the public transactions I have uncovered happened to take place after his death. Sarah also opened her own accounts at the Emigrant Savings Bank, possibly for some of the children. There were a few items in the ESB indexes for Sarah for which I could not find detail. Her first account, opened Sept 24, 1866, carried her personal identification information that she was born in 1806, Staffordshire, England, arrived in 1834, her husband was Andrew and she was nee S. Waldon [sic]. It also said she had a wart on her left eye. Her other three accounts were opened after Andrew's death, two in 1872 and one in 1873. Sarah's X mark on the Emigrant accounts as well as Andrew's administration papers suggest that she could not write. As recorded in the Long Island City Register of Death, Sarah died of long-standing heart disease on Sep 27, 1877 at her home on Second Avenue. We have found no obituary. Her youngest sons Edward and Charles, still unmarried in 1877, were probably her housemates at the time of her death. That Charles would have been resident at the breakup of her possessions could account for the fact that his descendants had Andrew and Sarah's 1832 marriage license and two other 19th century papers. Sarah had no will, administration or probate papers on file in Queens County Surrogate's Court. She was buried with Andrew and her two sons William and John (gravestone transcription), in what we now know as Our Lady of Mt Carmel cemetery. (Her death register entry called it "St. Mary's," which was Mt. Carmel's evolving name during the 1870s.) The age and date in the gravestone transcript (September 28, 1877 at 78) are incorrect. She died September 27th and age 73 is more likely. Death certificates are notoriously plagued with errors. An interesting reflection on her children's memory of Sarah can be seen in the fact that only two of her childrens' spouses recalled Sarah's surname properly on her spouse's death certificate. Most knew her given name was Sarah. Only two informants, the widows of Sarah's youngest sons, Charles and Edward, supplied Matthews as maiden name. These are the sons who lived with Sarah at her death. In an interesting twist, Henry's and Peter's widows named her as Sarah Porter -- a name for which I find no source. They lived next-door to each other and this is an object lesson in how bad information can be shared. Amelia Jones's son Walter mistakenly listed his paternal grandmother's surname, Fisher. Widower Andrew Jr's daughter simply listed "unknown." I don't have a DC for Catherine Butler. Given first generation statistics like this, it's no wonder the facts of Sarah's life are buried. It's been a privilege for those of us who have been scratching away at the sediment. This implies 1803-4 birth year, which is closer to the 1805 given in the Shuker bible than dates implied by gravestone transcript and property document (1799). Also note discrepancy in day of death. Gravestone=Sept 28, LIC Register=Sep 27. The register lists many burials at this "St. Mary's." St. Mary's was the name by which the church of Our Lady of Mount Carmel was known until some time during the 1870s. The cemetery is directly south of the property upon which the old church stood. A subsidiary page on Mt Carmel/St. Mary's Cemetery also accessible through the Fagan Family page and the Maps Menu.